Announcing the MAO Ceramics Veterans Day Givaway Contest! You must be a member of the MAO Ceramics Yahoo Group to enter. Contest will end Friday November 20 (unless further clues are needed. In that case the deadline will be extended). Take your time! A drawing will be held from among those entries who correctly answer the Veterans Day themed question. If the question proves too hard (unlikely I think) I will provide further clues. 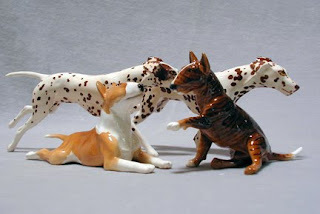 The prize will be a custom glazed Justine in Appaloosa. Bonus points will be awarded if you not only answer the question but also tell me why I picked that particular subject and how it relates to Veterans day. For everyone who enters, there will be a second drawing. The prize will be a dog themed pin. Arlington National Cemetery is the final resting place of thousands of veterans. We all know the most visited grave at Arlington National Cemetery is that of John F. Kennedy, but whose grave is the second most visited? Summer finally arrived here in southern California. It's been nearly ninety degrees at the beach and over one hundred inland. It makes it rather hard to run a kiln in the heat, but I've managed to get few things cooked. 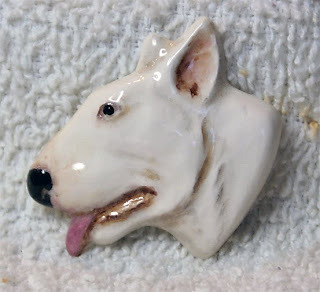 I completed a new Bull Terrier pin and a load of Happy Bullie pins are in the kiln now. I've been sculpting a bit more in the heat. 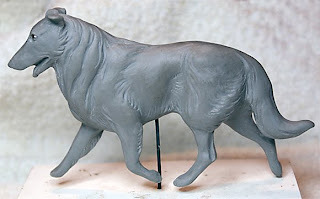 Laddie the collie is coming along nicely. I started a lying dog as well. 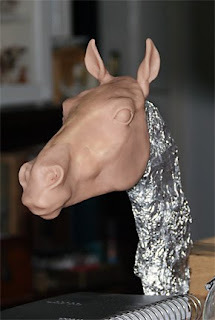 I still want to sculpt a mule but have not had time to start one. Most work for the next two months will be devoted to Bull Terrier items. I sent my money in. I will be vending at Silverwood, the National Bull Terrier show in October. I am going to try to sneak a few Justines in here and there though. I did a little more work on the appaloosa Justine. I have decided that will be the prize in my giveaway contest. The contest will be in November. Mark your calendars now! When I was young I had no real interest in cemeteries. Now that I am middle aged I have developed an interest in them. I find the headstones fascinating. For the past few years I have been visiting the graves of relatives and ancestors, in a search for my family history. I think that is where it started. 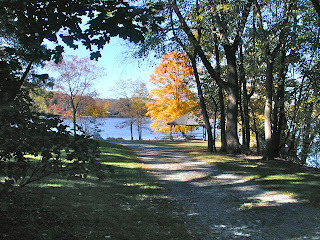 In October 2008 I had the opportunity to visit Sunnybank in New Jersey. It is now officially known as Terhune Memorial Park. Sunnybank was once the home estate of author Albert Payson Terhune. He wrote many books, articles and short stories about dogs, mostly his own dogs. There was a huge Victorian house there, appropreately named Sunnybank House, a barn, and Terhune's kennel where he raised his collies. Sunnybank is the last resting place for many of those same collies. It's all gone now. The house was torn down in 1969. The barn and kennels long gone, but the dogs remain as, really, the only thing that hasn't changed. 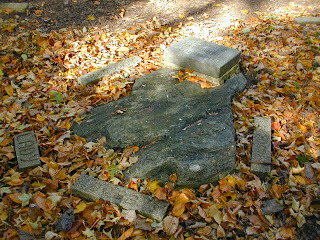 Champion Rock was a natural rock formation located above Sunnybank House. 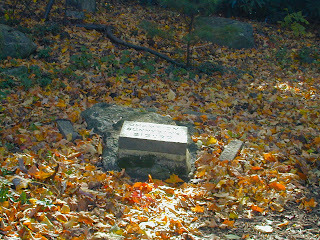 Terhune buried his champion dogs here. Some were show champions but others just his best "chums". There are several grave sites scattered around the grounds. His favorite collie, Lad, has a separate site away from the others. Down in a wooded area nearer to the lake is another cluster of graves. Dogs he had late in his life. Not all of his known dogs have marked graves. No doubt they are here as well, in some unmarked resting spot in the woods. 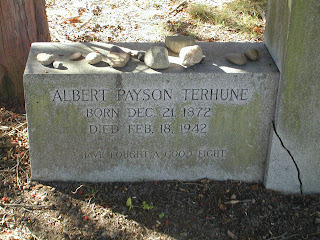 Terhune's own grave is located in the nearby town of Pompton Lakes, NJ at the Pompton Lakes Reformed Church Cemetery. We visited there and found his grave. Stones had been placed atop his gravestone and that of his wife Anice on the other side of the headstone. I thought it quite odd. I have no idea if it had meaning or just the local children playing in the cemetery. All in all I was somewhat disappointed. Terhune's Sunnybank that he wrote so glowingly about just wasn't there for me. His love for The Place came across so strongly in his writing, I could almost feel being there when I read his books. I went looking for a place that had not been there since 1942. The land and lake are still beautiful and I see why he loved it so. I wish I had seen Sunnybank House in it's heyday, with it's wisteria covered porch and collies romping to the lake through the woods. Well, poop. If it's not one thing it's another. My computer glasses broke last night. Broke right in half at the nose bridge. I'll just go to Lenscrafters, I thought. They are pretty fast if you get the no frills stuff. Off I trooped to Lenscrafters this morning. "Can't fix that" the young man said. Well here's my prescription sell me a cheap pair for now. Off we go to the clearance section. As I'm looking over the frames, quizzing him on prices, he looks over the script. He then proceeds to tell me he can't get me any glasses without an exam. "California State law, the prescription cannot be over two years old". Must be a new law, as I had never heard of it. If I have to get an exam then I'm going to my eye doctor and use my insurance to pay for it. Which leaves me using half a pair of glasses. Interesting thing about my eyeglasses, I only need the left lens to see the computer. They just keep falling off my nose though. I'm trying to figure out how I can turn it into a monocle. So after being sick for so long but not quite up to returning to work, I decided to take a week's vacation. I get very industrial when I'm not working my regular job. I have so much more energy to do creative projects. I cast, cleaned and fired a few things. I have a small stock of the new mare to work with, and plenty of Bullies. 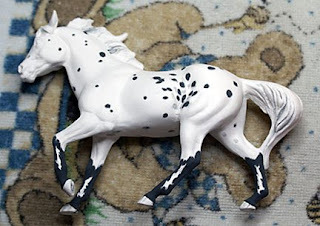 I started the appaloosa above this week. This is the first coat of underglaze. All brush work and etching at this point. I need to get a new bottle of latex to start the rest. Did I tell you the new mare has a name? I call her Justine. Maybe if I can get my act together I will do a giveaway contest for one. I'll have to come up with some type of interesting contest. I also managed to clean up my room in the house. It took five days but I can now use the work table in there. Not only that but I can actually walk around in there without tripping over something. The room houses most of my Breyer collection on the walls but the middle of the room has space for the table. I've set up some sculpting and other work that I can do in the house. Even though I live near the beach it still gets pretty warm out in the barn in the summer. Above is a couple views of some of the sculpting going on. 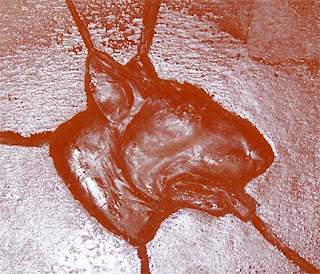 Lastly I sculpted this little pin, a Bull Terrier head. This actually opposite of what the finished one will be. This is the negative side of the rubber master mold. I'm pretty excited about pins right now. They are so fast and easy to make. I'd like to branch out into other breeds and horses. That's right, "Lost Month" not "last" month. For the first time in years I was drop dead sick. Aches, pains, barf and no food, the whole nine yards. I had to visit the Doctor twice. Now while I normally don't mind not going to work, but nearly four weeks of Maury was getting to be too much. I was starting to enjoy Steve Wilkos too. I watched a lot of BBC America. I missed food, but losing eight pounds was a strange side benefit. If that wasn't enough I had to switch my Health Plan in the middle of all this. As of the first of July I hadn't gotten my new cards or information. I started bugging the contact person at work about it. "I'll email and check", "You're all signed up. Call and get your subscriber number". The card finally came. Wha? It says I'm in an HMO. I signed up for the PPO. Contacted Lady again. "Oh. We found that last week and corrected it". Hmmm...like when I contacted you the week before? Swiftly received new cards but the Blue Shield website is still in error (you are not active, we have no information). I finally contacted their Webdesk, "We'll fix it. Might take a week or two, check it later". So after all the the fun experiences with Blue Shield (and they are pleasent enough on the phone), I had to get my RX benefits fixed too. RX is separate with this plan and administered by another company. I called them. I found out there is another Margaret Olson who works for the State of Alaska. That was the only one they could find. So off to contact the Lady again. "I contacted them. There was some sort of error. It's fixed now." Great! Now I can get some meds for the flu. Hazzah! I wonder if anyone else at work had this much trouble? The positive of all this: I had two days I felt good enough to cast some dogs and the new mare. Maybe next month I'll feel like glazing. I did some casting this weekend. My newest horse mold was something of a success. I did manage to get a horse out of it without the troubles I expected. I am happy about that. I did have a few minor issues but nothing a little patience won't cure. I have a real problem with time. I don't have enough of it. 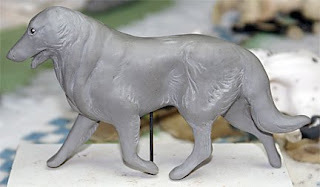 So I tend to rush my castings out of their molds rather than wait for them to come out on their own. I think this one is going to need patience to set up in it's own time.